Profit and Loss Report for Excel is a simple alternative to accounting software for a small business to track expenses and produce profit and loss reports. It is organized to make it easy for you or your tax accountant to fill out U.S. Schedule C (Self Employed Tax Form) for the tax year. Categorized expenses can be entered into monthly worksheets which flow through to a summary report with rolled up quarters. Income entered in this report then calculates profit and loss on a monthly and quarterly basis. A separate Data worksheet allows the entering of company information and a vendor list which can be automatically sorted alphabetically. 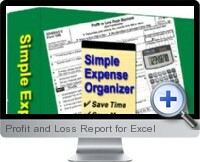 Profit and Loss Report for Excel is ideal for home business, small businesses, and self employed individuals requiring a simple to use profit and loss reporting solution. If your business has outgrown the shoebox organization method, but not ready for accounting software, then this product is for you.